Former Aston Villa chairman Sir Doug Ellis hopes to live long enough to see the club return to the Premier League. The 92-year-old sold Villa to Randy Lerner in 2006 and was at Old Trafford on Saturday to see them relegated for the first time since 1987. "We are going to have great difficulty in returning in one year but I've seen some encouraging signs and we've a reasonable chance," Ellis told the BBC. "I hope I will still be alive - I am only 92 remember - to see that happen." Speaking to BBC Radio 5 live's Sportsweek programme, Ellis added: "I don't think I could be any sadder than I am today but it has been obvious since Christmas that we were going down." Villa began the season with Tim Sherwood, who had taken them to the FA Cup final the previous season, as manager. He was sacked in October after six straight league defeats and replaced by Frenchman Remi Garde. However, with Villa still bottom of the table, the former Arsenal midfielder lasted only 147 days in the role before he was dismissed in March, with Eric Black taking temporary charge. Ellis appointed 13 managers in his 35 years as chairman and believes whoever become Villa's new boss should have experience of the British game. "That would be an advantage, it's got to be someone with a background of coming through the divisions, certainly the second tier," he said. Former Villa captain Dennis Mortimer, who lifted the European Cup with them in 1982, believes former Leicester boss Nigel Pearson is the outstanding candidate for the job. "I said when Remi Garde was put in that they needed someone who has been in a similar situation and that was Nigel Pearson," Mortimer told Sportsweek. "With his understanding of the English game he would have given it a better go than Remi Garde. "It definitely has to be him, people talk about David Moyes but I think Nigel is more current. "I wouldn't have thought he'd be sitting back over the last 12 months, he would have been putting together a portfolio of players. "He wouldn't be relying on the chief scout they have got at Villa now because that has been a disaster over the last few seasons and they are paying the price for it." Lerner, who put the club up for sale in 2014, recently agreed changes to the Villa board, with former player and manager Brian Little returning to the club alongside former FA and Manchester City chairman David Bernstein. Mortimer agreed it was a "step forward" but added: "It's probably five years too late. "Randy thought he could do it the American way by putting in people to look after the club for him but he missed a trick on how English clubs operate. 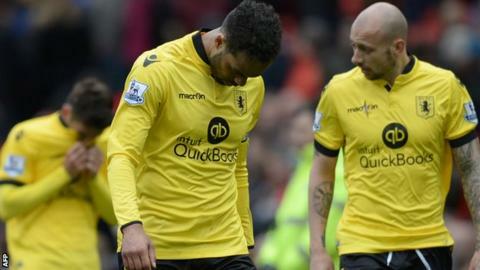 "It's a difficult league, the Championship, many teams have gone down and not come back up, we can see the lower divisions littered with teams that once played in the Premier League and that's something Villa can't afford. "I think this next month is so important for them, they need to get the manager in there right away sorting out what he needs and then they start the season fresh."